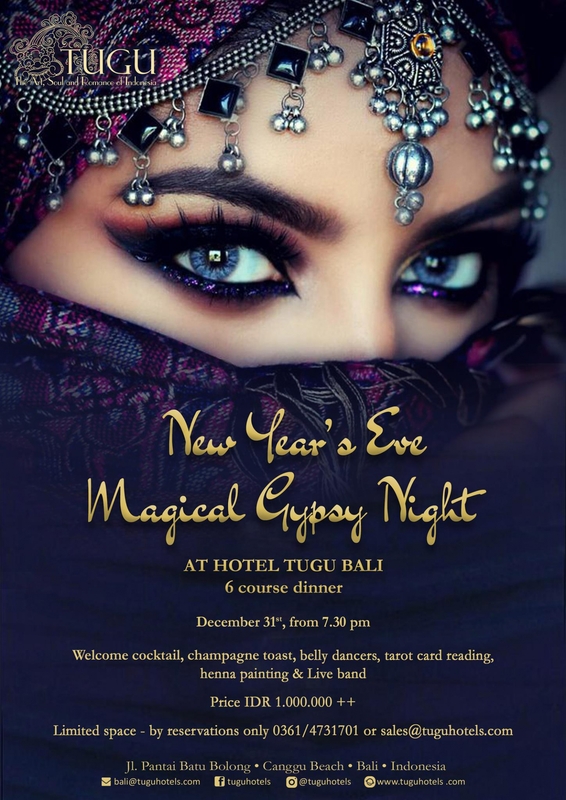 Tugu is bringing the Gypsy bazaar to the shores of Canggu. Bringing beautiful colors and exoticness to our bon vivant new year’s eve party this year, we are inspired by the nomadic lively evenings of the wandering musicians and singers originating from India, who traveled through Central Asia and the Middle East before arriving at the doorway to Europe. Start the evening with a beautiful Balinese New Year’s Eve blessing ceremony followed by a welcome cocktail. Travel with us on a gourmet culinary journey. Sampling a modern contemporary take of Indonesian dishes fused with global cuisines through a beautiful 6-course dinner such as Duck leg rendang with coconut rice and raw sambals, Kobe style black Angus tenderloin to local fresh – fare snapper with a corn & turmeric soup. Look into your future with tarot card readings and enjoy the age old art of henna and belly dancing. As we approach countdown, have a champagne toast while enjoying the Gypsy bazaar and the tropical grooves from our live band.